Dorset is among England’s most pleasant counties, but its peaceful rural scenery has a dramatic history, evidenced by the presence of Maiden Castle. The largest hillfort in Europe, this enormous collection of earthworks is three miles long and encloses an area of about 30 hectares. The site was first used about 5,000 years ago, but acquired its massive ramparts in around 400 BC and was then used on and off throughout the Roman period. Even after 1,400 years of erosion, the ramparts remain up to 20 feet high in places. Bath is a glorious green and hilly city, bursting with history. Among its many attractions is the excellent Museum of the Roman Baths, where you can learn about how the Romans adapted existing British beliefs about the hot spa, which had been a sacred site for centuries. The spa was also responsible for the city’s golden age in the 18th century, when it became the most fashionable place in Britain. Neighbouring Bristol was established during the Saxon period but only really took off as a port when trade with Britain’s American and Caribbean colonies began to expand in the 16th and 17th centuries in commodities including tobacco, sugar, and, probably most importantly, slaves. You can learn about the city’s both proud and shameful history in a number of excellent museums, in particular the new British Empire and Commonwealth Museum, housed in Isambard Kingdom Brunel’s terminus building for the Great Western Railway at Temple Meads. Elsewhere in the city you can visit two more of Brunel’s amazing creations. In the regenerated docks you can go aboard his SS Great Britain, built in 1843, the first ocean-going iron ship driven by propeller, now almost completely and miraculously restored after decades spent rotting in the Falklands. Alongside is a replica of John Cabot’s ship Matthew, in which he sailed to Newfoundland in 1497. West of the city centre in the affluent Clifton area is Clifton Suspension Bridge, another of Brunel’s engineering marvels. It was completed after his death in 1864 and majestically spans the Avon’s deep gorge at a height of 75 metres. Away from Bath and Bristol, Somerset is a quiet, rural county, a mixture of rolling hills and flat land reclaimed over the centuries from coastal marshes, populated with small towns. Among its historical highlights is the tiny city of Wells, famous for its cathedral, which represents the peak of late-medieval architectural engineering. Its features include the tall scissor arches in its interior, that separate nave from choir and support the central tower, and the 300 statues that adorn the West Front. The cloisters, chapter house and Cathedral Close all survive, as does the 13th century Bishop’s Palace, which once had a portcullis and still has its own moat. Many of the county’s other historical sights also have religious and legendary connections. Glastonbury Abbey, finally destroyed during the Dissolution of the Monasteries, was supposedly the oldest surviving Christian church in England, founded in the 4th or the 5th century. According to legend, Joseph of Arimathea brought the Holy Grail here, and it is where the great King Arthur and his Guinevere were claimed to be buried. An excellent museum tries to sort fact from legend. You can also climb nearby Glastonbury Tor, rising like an island from the surrounding countryside. A tall conical hill scored with the traces of medieval agricultural terracing, upon it stands St Michael’s Tower, the remains of a 14th century church. Wiltshire is probably most famous for its prehistoric monuments, which illustrate how important this beautiful part of the country was during the Stone and Bronze Ages. 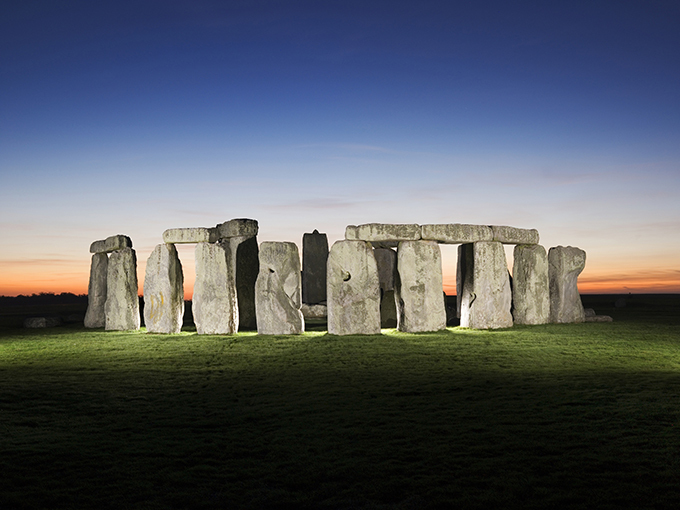 The most celebrated, of course, is Stonehenge on Salisbury Plain, built in a series of phases between about 3000 and 1500 BC. An excellent visitor centre helps explain what is known about its history and purpose. You can also visit the neighbouring Woodhenge, a circle of similar size and age that consisted of six rings of wooden posts and was discovered through crop marks in aerial photographs in the 1920s. Only about 20 miles further north, standing within a few miles of each other are Avebury, the largest stone circle in Britain, covering 30 acres and also built in the third millennium BC; the enigmatic Silbury Hill, a 130 feet high conical, grassy mound raised about 2500 BC; and West Kennet Long Barrow, a huge burial mound built about 3200 BC. Further south, in and around Salisbury, you can see the products of a later age of monument building. Old Sarum, just north of the cathedral city, is now a windswept, deserted site of earthworks and scanty stone foundations, but there was a large fort here during the Iron Age, then a medieval castle, cathedral and town, whose inhabitants left in the 13th century to move to the more hospitable Salisbury. At Salisbury itself you can visit one of England’s finest cathedrals, with the country’s highest spire (404 feet); its oldest working clock, built at least 700 years ago; and the largest Cathedral Close, with a fine collection of medieval houses. West of the city is Wilton House, a fine mansion rebuilt in the mid-17th century by Inigo Jones after fire destroyed its Tudor predecessor, raised on the site of a Benedictine Abbey. Devon is a county of spectacular coastal and moorland scenery, with the wild expanses of Dartmoor and Exmoor in its interior and the balmy beach resorts of the English Riviera along its south coast. Among the many exceptionally pretty settlements along its northern coast, the most celebrated is Clovelly, a tiny fishing village that tumbles down steep hillsides to a stony beach and 14th century jetty. You can also visit Barnstaple, a little way north along the coast, tucked up in the estuary of the River Taw, where you can go to the Museum of North Devon, and the Barnstaple Heritage Centre, which focuses on the social history of the region. Further west is wild and beautiful Cornwall, once the Celtic kingdom of Kernow, and a source of trouble for both the Romans and medieval English Kings. The only one for whom the Cornish always seemed to have had plenty of respect was King Arthur, born, according to fanciful medieval chronicler Geoffrey of Monmouth, at Tintagel on the northern coast. 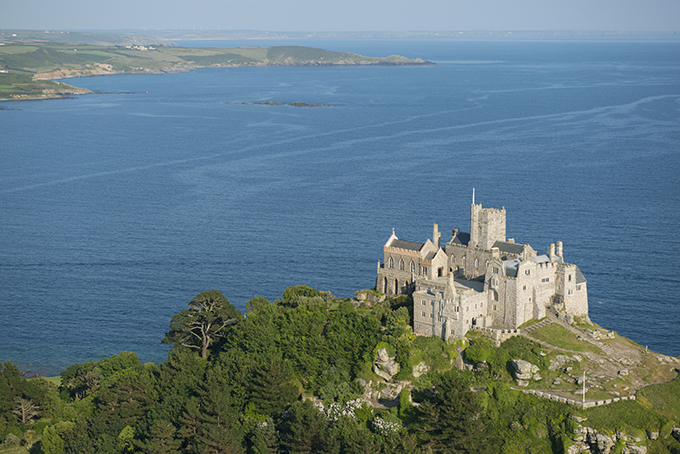 It is still a great place to visit today, and you can explore the ruins of a 13th century castle and of an earlier Celtic monastery, both built on a dramatic rocky island headland. There are many wonderful places to visit in Cornwall, but the Land’s End peninsula in particular is a fascinating place, with ancient villages and farming hamlets, and fields that have been in continuous use since the Bronze Age. Off the south coast near Penzance is the delightful St Michael’s Mount, a small island only accessible at low tide across a causeway, where you can visit the remains of a medieval priory. On the wild moorland around the northern coast of the peninsula stand the ruins of tin mines that reach deep into the cliffs above the sea, relics of a lost industry. You can explore the surface buildings and parts of the workings themselves at a small museum near Pendeen.